Wood Curtain Rods and Poles in a variety of sizes and styles from unfinished to stains and colors with matching wooden hardware and window treatment accessories including wood finials, wood curtain rings, wood brackets and coordinating decorative wood drapery rod accessories. The Whole Enchilada wood curtain rods is comprised of a HUGE selection of finished and unfinished, plain and decorative wood curtain rods and wood curtain rod poles with matching window treatment accessories and hardware consisting of finials, rings, brackets and more. These decorative wood curtain rods are available in 4ft to 16ft lengths and are available in dozens of designer finishes. Traditional old world craftsmanship in over 20 gorgeous finishes, each hand finished in the USA can be found in these custom wood curtain rods and window treatment accessories by Finestra. 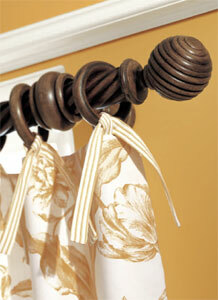 Exquisite design details with every option you could need can be found in these wood curtain rods. Poles up to 16 feet in length include smooth, fluted, diamond/square, and traverse options. 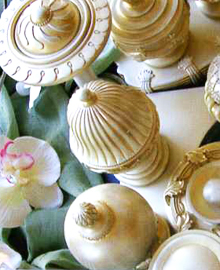 The hardware includes holdbacks, finials, endcaps and decorative inside mount options. These custom wood curtain rods include sizes from 1 3/8" to 2" and 3" diameter that are custom finished and shipped within 5 business days. The Highland Timber unfinished wood curtain rods offering features a gallery of masterfully carved wooden finials and wood curtain poles with wood rings and brackets. These wood curtain rods hardware accessories are all unfinished for the do it your selfer and interior designers who are custom coloring their window treatments. The Highland Timber unfinished wood curtain rods offers four wood pole diameters rangeing in size from 1 3/8", 1 3/4", 2 1/4" and 2 3/4" in either a smooth or reeded style. The selection of wood finials allow you to mix or match and range from understated and simple to intrinsically elegant designs. Five styles of unfinished wood brackets are offered as well as two styles of unfinished wood rings, both with eyelets in either the plain or reeded style. Traditional wood curtain rods and hardware offers accessories including finials, wood rings, holdbacks and brackets in a variety of styles and finishes all at budget prices. Classic wood curtain rods hardware accessories features finials, wood rings and brackets in furniture quality finishes that are in stock and ready to ship out today. 1 3/8 inch and 2 inch diameter wood curtain rods in colors featuring Espresso, Mahogany, Walnut, Pecan, Antique White and Unfinished are offered. 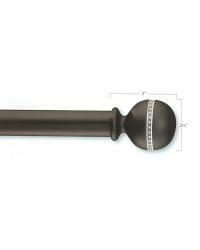 Fluted and smooth wood curtain poles are offered in lengths of 4, 6, 8 and 12 feet. These wood curtain rods and hardware accessories offer holdbacks, rings, inside mount brackets and swivel sockets. This budget line of wood curtain rods and poles is manufactured from the highest quality hemlock and comes in diameters of 1 3/8", 2", 2 1/4" and 3", with lengths of 4, 6, 8, 12 and 16 feet. 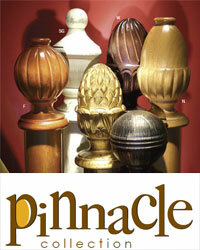 The fun is just beginning as these wood curtain poles are offered in a smooth, reeded, fluted and a twisted rope look. 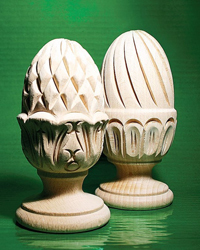 With 14 great colors to choose from, you'll next have to make a finial choice from the Ball, Sherwood, Traditional, Temple or Simplicity finials. Next are all the coordinating window treatment accessories and hardware that offers plain or European style brackets as well as curtain rings with eyelets that will give your wooden curtain rods a finished look. Robert Allen Bedpost wood curtain rods and hardware offers simple style, in handsome beech and pine hardwoods that are turned and hand carved into the shapes of traditional country finials with the look of furniture knobs. Brackets, curtain rings and tieback holders are also offered to help complete the look of these great looking wood curtain rods. Wood Poles are available in smooth or twist with sizes of 1.25" and 1/75" in 4 and 8 foot lengths with rich stains which are worked into the grain to reveal a natural strength of character. Shop and buy budget priced unfinished wood curtain rods in this extensive selection of unfinished wood curtain rods and poles with all the hardware and accessories. Buy wood curtain rods with matching hardware in a variety of diameters that include 1 3/8 inch, 2 inch, 2 1/4 inch as well as a beefy 3 inch wooden pole. Available in 4, 6, 8 and 12 foot lengths the budget priced unfinished curtain rods offer a variety of shapes from the basic smooth, to fluted and reeded as well as twist or twirl. Being unfinished makes it great for those wanting to save money as well as those wanting to stain or paint the poles themselves for that custom designer look. Often one will just leave the wood bare so they can enjoy the beautiful natural wood grains. These unfinished wood curtain rods come with coordinating hardware and accessories that includes unfinished wooden finials, unfinished wood curtain rings and unfinished wood brackets. The Canterburys classic wooden designs present smooth silhouettes with modest details. Rich finishes add natural warmth to traditional window settings while blending with the overall decor in this wood curtain rod collection. The Elite wood curtain rods features a budget priced wood curtain pole collection which features wood finials with metal accents for the ultimate in elegance. This 1 3/8" diameter wooden curtain rod and hardware accessories features a unique look not found in other decorative wood curtain rods. 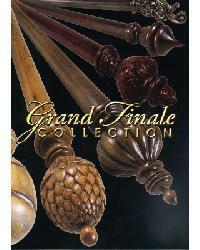 The Grand Finale features two types of wood curtain rods, rings and hardware. The first type is a 2" traversing wood curtain rod which features a high quality aluminum track system that has been inserted into a notch which has been cut out of the backside of the wood curtain rod. The Grand Finale wood traverse rod is an orchestra of beauty, quality and durability. 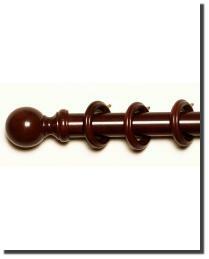 The other wood curtain rod type in this offering features the same wood finials and wood curtain rods, but without the notch cut out or track. 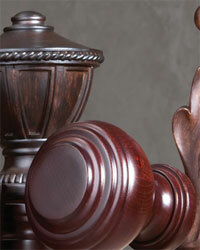 The wood curtain rods and finials without the track offer optional wood rings for traversing. Both types of track are intended as a hand traverse system. No Strings are some of the highlights of this wood curtain rod collection. 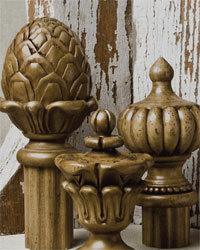 All items (except the rings) are made from sustainable tropical hardwoods and feature carved finials in 6 rich finishes. Hidden Metal Mounts with no visual distractions along with easy installation. The Kailey decorative wood curtain rods and finials offers intricate details and smooth surfaces to adorn the looks of your drapery and curtains. The intricate designs of the Kailey wood curtain rod finials will make a grand statement at the end of your wood curtain rods. Choose from window treatment accessories and hardware that includes holdbacks, curtain rings and brackets that reflect an artisan's attention to detail. The Mission wood curtain rods and hardware by Graber offers the hallmark of the mission style of furniture is its artful craftmanship, which is echoed in the styles of finials, rings and brackets. 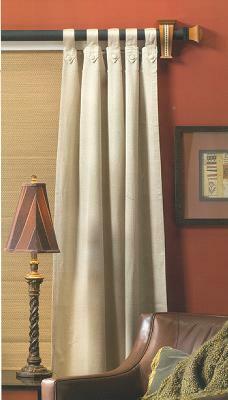 This budget priced wooden curtain rod offering comes in a 2" size that is perfect for most any window treatment. 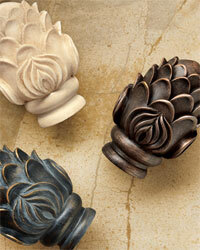 Traditional carved wood curtain rods and hardware in stock and ready to ship. 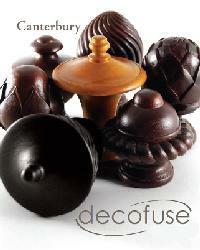 Choose from fruitwood, mahogany, natural, walnut, black gold, old gold and sand gold finishes. 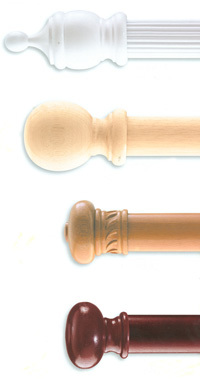 Make a statement with these 2 inch diameter wooden curtain rods for your window treatments. These wood curtain rods can be spliced to achieve extra long curtain rods. The wood curtain rods in the Pinnacle by Vesta lets you choose from smooth wood rods or reeded wood poles in 4', 6', 8' and 12' lengths. This assortment of wood curtain rod hardware and accessories include wood brackets, wood curtain rings, wood holdbacks, curtain pull wands, supports and more, all in wood for adding great looks to your window treatments. This huge selection of wood curtain rods and poles with coordinating window treatment accessories and hardware feature every major manufacturer with prices from budget to high end selections to suit everyone's budget and decorating tastes. 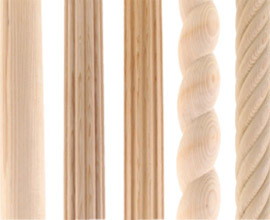 Several manufacturers offer unfinished wooden curtain rods with matching wooden hardware. You may also choose from decorative designer wood curtain rods which offer choices in stains to painted finishes in a gorgeous color range that includes golds and silver. 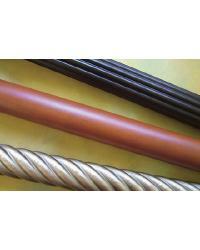 The variety of wood poles that are offered include smooth finish, reeded and twirled or twisted shapes as well as bamboo, in sizes that range from 1 1/4", 2" to 3" in diameter and in lengths from 4 feet to 16 feet. When looking through the variety of decorative hardware you will find that the designs in the coordinating wood curtain rod finials, wood curtain rings and brackets offer modern as well as traditional looks.